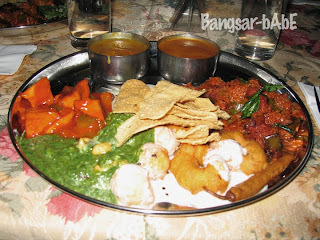 Annalakshmi serves an array of delectable vegetarian dishes. It operates on the concept of “eat as you want, pay as you wish” where the guest decides on how much to pay. The staffs are all volunteers and funds collected from the restaurants will be used for charity. Not sure what they are called but I liked the spinach puree and the brinjal curry (right). I had another serving of that. 😛 rif pau-ed some of my brinjal and spinach too. 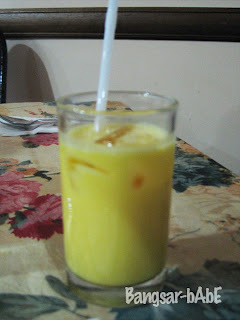 The mango lassi was thick and refreshing. Better than the sourish diluted ones you get from Indian restaurants outside. When we paid for the meal, the guy told us there was an additional 5% tax on top of how much we give. 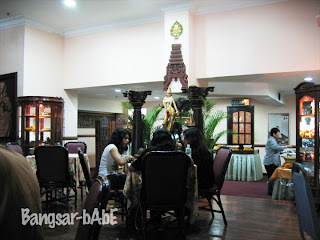 Shifted to somewhere Opposite the Brickfield’s Buddhist Temple.